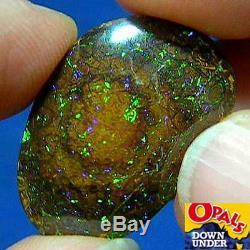 Electric Greens 24ct Natural Australian Solid Yowah Nut Boulder Opal. 24.4mm x 16.9mm x 6.7mm thick. This natural australian solid yowah nut boulder opal has electric greens as its dominant color whilst the other colors include violet. The colors flash and flicker brilliantly with rotation of the opal and the colorshow is seen from every angle. There is a natural seam on the surface, however the strength of the opal is excellent. We pride ourselves in offering you boulder opal with bright gem colours. We go the extra mile to offer top quality opals in all price ranges. The item "Electric Greens 24ct Natural Australian Solid Yowah Nut Boulder Opal Video" is in sale since Tuesday, August 8, 2017.